ADDIS ABABA, Apr 19 2019 – Following 2018 elections in Ethiopia, a record-breaking number of women now hold leadership positions in the country’s government. 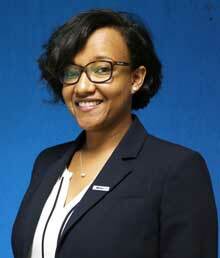 But women still struggle to rise up the ranks in other sectors. I am thrilled to witness the fantastic changes that have taken place in Ethiopia over the recent months, with women assuming leadership positions at the highest levels of government. The best part of this narrative is that little Ethiopian girls will now see a woman president or minister as the new ‘normal’, and no longer the exception. I find this quite inspiring! But in my field of work – the water, sanitation and hygiene (WASH) sector – we are yet to see a sensible percentage of women in leadership roles. The participation of women is most often seen in community water supply management frameworks, where women are included within the team that manages the water supply system. This is important as the intention is to sustain the benefits of the system by both genders, but also ensure both men and women are equally engaged. However at sector level (i.e. where policy, resourcing and planning are usually discussed and decided upon) there are very few female decision-makers. I am often one of the only women leaders in the meetings I attend. And when the question ‘why aren’t there more women present?’ is raised, the response is often ‘there aren’t enough qualified women out there’. This is not an accurate response. There are qualified women out there, but we need a reform in the sector’s approach to reaching those women professionals. 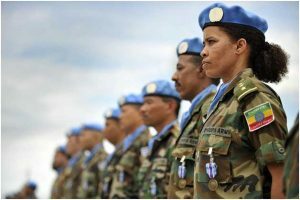 For example, organisations like CARE Ethiopia have achieved good results through reforming their entire recruitment process. CARE re-graded all their job descriptions, re-advertised positions 1 to 3 times if no women applied, head hunted, instituted a competency-based assessment system with written examination (coded so the panel does not see which applicant wrote it), and assessed and reconfigured the interview questions using a gender lens. This has brought the organization closer to meeting parity. •	I was and still am the youngest female in most sector meetings. For some time after I assumed the directorship, most assumed I was in an administrative or a support role rather than a leadership role (until I corrected them). It’s not enough to be in a role or to sit at the table. •	Speaking up confidently is critical (I have a colleague that is fond of the saying ‘fake it till you make it’). The greatest barrier that I and most of my female leader friends face in speaking up is fear of being ostracized or scorned – the dreaded ‘imposter syndrome’. •	I have learned that respect comes when one’s voice is heard. I have seen how our voices can help shape policy and perspective. I choose to ensure my presence is known as a leader and that it’s to be regarded as a contributor for good. Nearly three years into my current role as director, my voice is now sought after, and I can choose to be picky about how I collaborate with others. •	Trusting my voice by learning to control self-doubt was quite tasking, but I soon learnt to spot patterns of negative thought, identify them for what they were and train myself to trust my expertise. This led to speaking up more at meetings, ensuring I usually always sat at the front and participated. •	Celebrating unapologetically is not as easy as it sounds. I always found it interesting that many women in meetings, when introducing themselves, state their name and then their familial status while the men state their name and then their title. This is linked to the fact that the type of accomplishments that are given weight by society is what we sub consciously align ourselves with to garner acceptance. •	Finding a sisterhood to lift and celebrate one another has been paramount to my confidence. Given that most of the issues we face as women are partly similar, I find it very helpful to surround myself with women leaders who are on a similar journey and with similar moral values. One of my mentors is a woman whom I deeply admire, and she provides me with invaluable support. I am thrilled that this past year has been the year where barriers have been shattered, and we are seeing better gender balance in leadership. We are invited to the party, but it is important for the rules of engagement at the party to be equally accessible. 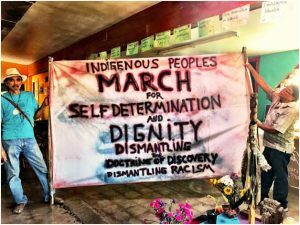 Apr 19 2019 – The United Nations, as in so many other areas, gives lip service in support of Indigenous issues while lacking the political will and enforcement power over individual member states to comply with the protection of fundamental human rights for the Original Nations of Indigenous Peoples of the world. UNITED NATIONS, Apr 19 2019 – Journalists around the world are increasingly seeing threats of violence, detention, and even death simply for doing their job, a new press index found. 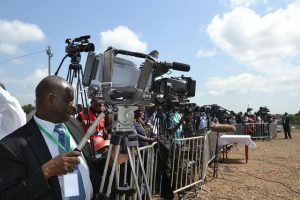 In the 2019 World Press Freedom Index, Reporters Without Borders (RSF) has found a worrisome decline in media freedoms as toxic anti-press rhetoric have devolved into violence, triggering a climate of fear. United States,” said RSF’s Executive Director Sabine Dolan during the launch of the index. Of 180 countries evaluated in RSF’s index, only 24 percent were classified as “good” or “fairly good” compared to 26 percent in 2018. The Middle East and North Africa (MENA) region continues to be the most dangerous area for journalists as they face violence due to ongoing conflicts while also being deliberately targeted, imprisoned, and killed. For example, Emirati blogger Ahmed Mansoor was sentenced to 10 years in prison after criticising the United Arab Emirates’ (UAE) government on social media. The persecution of MENA’s journalists has even extended past its own borders as seen through the brutal murder of Jamal Khashoggi in the Saudi Consulate in Turkey. Such a chilling level of violence has provoked fear among the region’s journalists, causing many to censor themselves. But of all the world’s regions, it is the Americas that has seen the largest dip in its press freedom score. Nicaragua for instance fell 24 places to 114th, making it one of the steepest declines worldwide—and with good reason. What started as protests against controversial social security reforms has turned into one of the biggest crackdowns on dissent and media in the Central American nation. Nicaraguans covering demonstrations have been treated as protestors or members of the opposition and have been subject to harassment, arbitrary arrest, and death threats. Some have been charged with terrorism including Miguel Mora and Lucia Pineda Ubau, journalists for the news agency 100% Noticias. Further north, the United States’ media climate is now classified as “problematic” as a result of an increasingly toxic anti-media rhetoric. Over the last year, media organisations across the country received bomb threats and suspicious packages including CNN, forcing evacuations. In June 2018, after expressing his hatred for the Capital Gazette newspaper on social media, Jarrod Ramos walked into the newsroom and killed four journalists and a staff member. Most recently, Coast Guard lieutenant Christopher Paul Hasson was arrested for planning a terrorist attack targeting journalists and politicians. population. And this is how it has contributed to create this climate of fear for journalists,” Dolan said. According to the Committee to Protect Journalists (CPJ), over 11 percent of the president’s tweets have insulted or criticised journalists and news media. In reference to a particular tweet by Trump which states that it is “disgusting” that the press can write whatever they want, former White House Correspondent Bill Plante noted that the U.S. is in a very “dangerous place” now. “It is one thing to steer news coverage, by putting things out there or leaking certain stories or trying to avoid coverage of other things—it’s entirely another to threaten reporters and to say that news coverage shouldn’t be allowed,” he said. This rhetoric has not only impacted journalists in the U.S., but has also spilled over abroad as world leaders from Venezuela to the Philippines use terms like “fake news” to justify human rights violations and crackdowns on press freedom. But it is not all bad news. Ethiopia made an unprecedented 40-place jump in the Index after new Prime Minister Abiy Ahmed took swift steps to improve press freedom including the release of all detained journalists. While such progress is promising, there is a long way to go to secure press freedom globally, especially as it seemingly regresses. “The only weapon we have is truth. The problem is that in today’s media environment along with social media, we can be overwhelmed. So we have to come out there with more effort than ever to get the truth out,” Plante said. 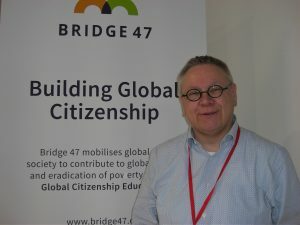 BELGRADE, Apr 19 2019 – Bridge 47, a Finland-based organisation created “to bring people together to share and learn from each other”, put global citizenship education (GCED) centre-stage at a recent annual meeting of civil society. International Civil Society Week (ICSW) meeting was held last week from Apr. 8-12 in Serbia’s capital, Belgrade. Co-hosted by the Johannesburg-based global civil society alliance CIVICUS and Serbian association Civic Initiatives, the event overall brought together more than 850 delegates from around the world, with Bridge 47 being the “biggest event partner”. The organisation’s sessions had more than 170 people taking part, and four sessions. But it was their sessions on dialogue that showed how often people misconstrue what others are trying to say and how that can lead to conflict and aimed to help diverse groups bridge communication gaps. In an exercise on silent communication, participants later explained in words what it was they’d been trying to communicate. Many of the “listeners” had got the signals wrong. Lappalainen said the name of the organisation comes from Target 4.7 of the United Nations’ Sustainable Development Goals (SDGs), set in 2015 for achievement by 2030. Goal 4 is to “ensure inclusive and equitable quality education and promote lifelong learning opportunities for all”. Target 4.7 is to ensure that by 2030 “all learners acquire the knowledge and skills needed to promote sustainable development, including, among others, through education for sustainable development and sustainable lifestyles, human rights, gender equality, promotion of a culture of peace and non-violence, global citizenship and appreciation of cultural diversity and of culture’s contribution to sustainable development”. That is a mouthful, and some people may be put off by the usual UN-speak, but Lappalainen told IPS the simple message is that educators, rights defenders and civil society groups need to “join forces” across different sectors and to “build bridges”. For the UN, an indicator of Target 4.7 is the “extent to which (i) global citizenship education and (ii) education for sustainable development, including gender equality and human rights, are mainstreamed” at all levels. Officials say that GCED is an important system to teach mutual respect. According to the United Nations Educational, Scientific and Cultural Organisation (UNESCO), global citizenship education is a response to the continuing challenges of human rights violations, inequality and poverty that “threaten peace and sustainability”. The agency says that GCED “works by empowering learners of all ages to understand that these are global, not local issues and to become active promoters of more peaceful, tolerant, inclusive, secure and sustainable societies”. Christopher Castle, chief of UNESCO’s section for Health and Global Citizenship Education, said in an interview that it was important for schoolchildren to be given the opportunity to think about values such as “solidarity and cooperation”. In addition to children, global citizenship education can benefit youth and adults, says UNESCO. This learning can be provided in various ways, but the main method in most countries will be through the formal education system. As such, governments can integrate the concept either as part of existing programmes or as a separate subject. The “values” of global citizenship have long been discussed, but the concept gathered momentum with the launch of the UN Secretary-General’s Global Education First Initiative (GEFI) in 2012. This identified “fostering global citizenship” as one of the three priority areas of work, along with access to and quality of education. During ICSW, participants at the Bridge 47 events included teachers, administrators and various members of civil society groups. Tom Roche, a furniture-maker from Ireland and founder of the NGO Just Forests, said the education sessions were useful in learning to create links and to navigate divides. Roche said that as a carpenter, he began questioning the use of imported wood in furniture-making and became concerned about the destruction of forests. Over the years, he has developed educational resources for schools in Ireland, to inform students about the effects of society’s dependence on wood, he said. He also gives input to policies for “responsible wood procurement”, despite lack of understanding from some associates. “People used to say: ‘oh, you’re a tree-hugger’, and I would say that ‘no, we need to be responsible about how we cut down trees,’” he told IPS. Roche added that he was at the Belgrade meeting to show support as well for the “frontline defenders” of the environment and of forests, many of whom have been attacked and even murdered over the past decade. “The issue is very important at this meeting, and it should be,” he said, pointing out that the GCED events provided “new ways to deliver the same message”. NESS ZIONA, Israel, April 18, 2019 (GLOBE NEWSWIRE) — Sol–Gel Technologies Ltd. (NASDAQ: SLGL) ("Sol–Gel" or the "Company"), a clinical–stage dermatology company focused on identifying, developing and commercializing branded and generic topical drug products for the treatment of skin diseases, today announced that management will participate in the BMO–sponsored Class of 2018 Biotech IPOs Investor Day taking place in New York, NY. Dr. Alon Seri–Levy, Chief Executive Officer, will provide a business overview and update on the Company's pipeline programs on Friday, April 26th at 10:30 a.m. ET. A live audio webcast of the presentation will be available in the Investors/Events & Presentations section of the Sol–Gel Technologies website at http://www.sol–gel.com. A webcast replay will also be available on this website shortly after conclusion of the event for 30 days. KUALA LUMPUR and SYDNEY, Apr 18 2019 – The World Bank’s Enabling the Business of Agriculture (EBA) project, launched in 2013, has sought agricultural reforms favouring the corporate sector. EBA was initially established to support the New Alliance for Food Security and Nutrition, initiated by the G8 to promote private agricultural development in Africa. The New Alliance has been touted as “a new model of partnership” for agricultural transformation in Africa. The Bank has used the EBA to address the land issue in developing countries, particularly in Africa. The US and UK governments as well as the Gates Foundation are among its strong supporters in line with their broader support for corporate agriculture. Emulating the influential annual World Bank Doing Business report, the EBA scores countries on the ease of doing business in agriculture. It purports to measure ‘legal barriers’ to agribusiness and to prescribe reforms in twelve areas, including seeds, fertilizers, trade and machinery. It advocates reforms in favour of agribusiness by weakening regulations over seeds, fertilizers and pesticides and strengthening foreign agribusiness power and influence. Missing from the partnership are peasants and indigenous peoples whose livelihoods depend on traditional land uses. The 2017 EBA report proposed a new indicator on land, initially piloted in 38 countries, to be extended to more in the 2019 report. The Bank claims to be seeking to better protect land rights and to ensure more equity in land access. It is biased towards industrial agriculture and agribusiness, and the intent of the new indicator makes it even more urgent to challenge the EBA initiative. As Frédéric Mousseau of the Oakland Institute emphasised, EBA best practices seek to promote large-scale ‘industrial’ or plantation agriculture, at the expense of family farmers and communities using the land in other ways, including pastoralists and those currently categorized as indigenous peoples including swidden cultivators, hunters and gatherers. The EBA advocates certain reforms and policy measures, raising concerns about its likely impact, if implemented by governments. The Bank advocates formalizing (private) property rights, enabling greater commercial sale and lease of land, claiming that productivity will thus be enhanced. UNCTAD’s 2009 World Investment Report cautioned that “Greater involvement by TNCs will not automatically lead to greater productivity in agriculture, rural development or the alleviation of poverty and hunger”. Even joint research by World Bank and IFPRI staff is circumspect about the claimed benefits of large scale commercial farming in light of likely environmental, social and productivity impacts. Large scale commercial farming has often involved environmental degradation, forced evictions and human rights violations, worsening food insecurity and livelihood destruction. Since the turn of the century, large-scale land acquisitions by transnational corporations in developing countries, especially in sub-Saharan Africa, have accelerated. Such land targeted by ‘investors’ has often long been used by local people who may not have property titles, often deemed unnecessary. Land use practices have often evolved with changing demography, ecology, knowledge, technology, political systems, commercial considerations and legal traditions. Such land may be legally deemed either public or state land, and/or land to which local communities claim customary rights, but many other hybrid permutations have also evolved. Unsurprisingly, ‘land grabs’ by new elites have encountered resistance from many of those opposing expropriation of what they see as their land. Success in delaying, disrupting or blocking new plantations, large farms and ranches has been varied and contingent on a variety of factors. Much public or state land in developing countries allows usufructuary rights in line with contemporary interpretations of customary practices. Natural resources, including land used in varied ways, are generally recognized as essential for sustaining the livelihoods of hundreds of millions, and subject to either state or community management. 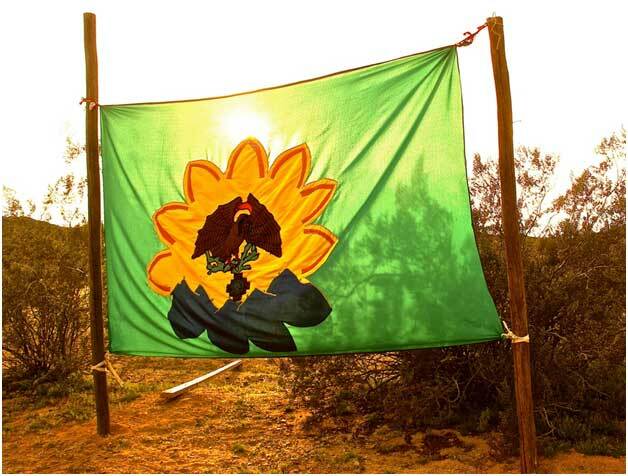 In many societies, land is still valued as a communal resource, often with deep social and cultural significance. Ignoring customary practices, the Bank is urging governments to privatize public land with ‘potential economic value’, to be put to its ‘best commercial use’. The Bank has been promoting the formalization of private land ownership to encourage agribusiness investments in capital-intensive agriculture, to increase productivity. 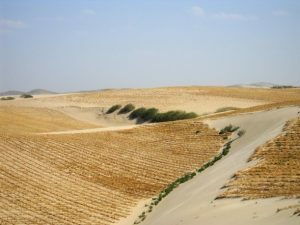 Commodifying land will enable more capital-intensive agricultural production as the Bank believes that “undocumented [land] rights pose challenges and risks to investors”. By scoring countries in terms of ease of accessing land for agribusiness, the new EBA land indicator seeks to accelerate land privatization and to facilitate corporate access to land in developing countries. By enhancing property rights and making land a ‘transferable asset’, its use as collateral for credit is also enhanced. The Bank strategy either ignores or seeks to take advantage of the considerable vulnerability of many family farmers, worsened as the land they depend on for their livelihoods becomes a tradable asset. The development of land markets increases commercial pressure on land, destroying the livelihoods of many depending on land and the commons—grazing and fishing grounds, and forests. By promoting land as a marketable commodity, the land indicator inevitably enables greater concentration of land ownership. In economies with ‘formal’ land tenure systems, farmers often lose their land to creditors. Extending such proprietary rights legally enables and thus accelerates land dispossession, concentration and grabbing. While jobs may be created for some locals, many more may be marginalized without much hope for alternative livelihoods elsewhere. Thus, facilitating corporate agriculture by concentrating control over land use is likely to exacerbate rural poverty and overall inequality. Land titling, purportedly to protect land users from eviction, thus accelerates dispossession of current land users. Hence, the EBA should be ditched. Instead, governments should be helped to design food and agriculture policies that empower family farmers, pastoralists and indigenous peoples to address the major challenges of poverty, hunger, malnutrition, environmental degradation, resource depletion and climate change. STOCKHOLM, Apr 18 2019 – The mining industry is one of the world’s most dangerous industries. Globally, the death toll is at least 14,000 workers per year. But how many lives are actually lost is something that neither trade unions, national governments or the United Nations know. The men were sitting down for lunch in the canteen. January was about to turn into February but for them life would end then and there. Suddenly, a flood of mud and sludge swept in. The iron ore mine Feijao was destroyed when a dam in the Brazilian state of Minas Gerais collapsed. At least 206 people died in the accident, which could probably have been avoided. Leaked documents have shown that the directors of the multinational mining company Vale knew about the dangers of the dam. Globally, the mining industry employs more than 24 million people. Everywhere – from China to Kazakhstan – miners go to work with their lives on the line. Most of the people who die do so in silence. The mining industry is full of informal jobs. And the number of fatal accidents is considerably higher than in most other sectors. Getting a thorough picture of the number of fatalities is difficult. When Arbetet Global took a close look at the ten biggest mining countries, it turned out that not even welfare states like Canada had comprehensive statistics. “In order to get these numbers you would have to contact every province, and then add the numbers together,” a representative from the trade organisation Mining Association of Canada writes. 21 mine workers died when a coal mine collapsed in the Chinese province Shaanxi. Local authorities have announced that more inspectors will review the so-called high-risk mines this spring. At least 206 people lost their lives in Brazil when a dam connected to the iron ore mine Feijao collapsed. More than two months later, 102 people are still missing. At least 18 people died in a gas explosion in a coal mine in Mpumalanga, South Africa. The victims allegedly worked in the mine without permits. At least 24 people lost their lives in an illegal gold mine in Indonesia after a big earthquake. Rescue workers also found body parts that couldn’t be identified from four other people. Four mine workers died in an illegal coal mine in the state of Nagaland, in northern India. The cause of death is unknown but it is believed that the workers inhaled poisonous gas. 20 mine workers died and 30 were injured in the Chinese city of Xilingol. The workers were on their way down into the mine when the breaks of their shuttle vehicle failed and the driver lost control of the vehicle. Glen Mpufane, Director of Mining at the global trade union IndustriAll, estimates that the mining industry claims thousands of lives every year. He stresses that the numbers are unreliable. Some counties have reliable statistics, but globally the reporting on fatal accidents in the workplace has major flaws. The ILO’s department of statistics, based in Geneva, calls itself “the world’s leading source of labour statistics”. But not even here do we find comprehensive information. A quick search in the statistical database reveals huge gaps in the reporting. “We don’t know all that much about work-related fatalities in the world. We only get data if it’s collected on a national level,” says Rosina Gammarano, economist and statistician at the UN agency. If you want figures concerning employment, stock prices, or BNP-development, all you need to do is a quick google search. For figures relating to health and safety in the workplace however, you’re much worse off. Part of the explanation is that responsibility for the reporting is often divided among several departments, as opposed to, for example, financial statistics. But the main problem is something else, according to Rosina Gammarano. For Rosina Gammarano and her colleagues, the unwillingness to report fatalities is a source of frustration. For the employees of the world, this is, literally, a question of life or death. A decade ago, the International Federation of Chemical, Energy, Mine and General Workers’ Unions (ICEM), which has since merged with IndustriAll, estimated that the yearly number of deaths exceeded 12,000. The decrease is mainly due to lower death tolls in China. In 2005, almost 6,000 workers lost their lives in the country’s coal mines alone, according to official statistics. In 2018, the number had decreased significantly, to 333. The independent labour rights organisation China Labour Bulletin (CLB) deems that these numbers reflect an actual decrease, even though many deaths still go unrecorded. “Those are the accidents and deaths that have been reported. There’s always a risk that some have been silenced, that happens regularly,” according to Director of Communication Geoffrey Crothall. In the early 2000’s, the Chinese coal marked grew explosively. The country’s massive investments in infrastructure demanded cheap energy and regulations for this wildly growing sector was not prioritised. According to CLB, the government has since increased the number of health and safety inspections, but Geoffery Crothall argues that the decreasing death toll mostly depends on reduced production. Hundreds of thousands of coal mining jobs have disappeared as the Chinese economy has slowed down. This pattern is visible all over the world. In the industrialised world, efforts to increase health and safety in the workplace has led to fewer deaths, but globally the decrease stems from the fact that the sector now employs fewer people. In 1998, the ILO estimated that 36 million people were employed in mining globally, of which six million worked in the informal sector. 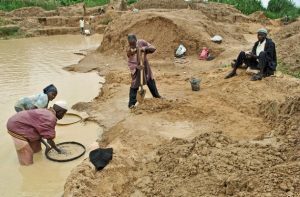 Today, the UN agency estimates that there are 24 million mine workers, including both formal and informal employment. ILO is currently collecting information as grounds for a new estimation on the informal sector, a process which involves several different ILO departments. Trade unions say that the lack of reliable statistics complicate their work, while the ILO says that unwillingness to report deaths hides the true scope of the problem. But even if all of this would change – if correct reporting of workplace accidents all of a sudden became a top priority on the global political agenda – would a complete picture of the human cost of the mining industry become clear. When IndustriAll estimates the yearly amount of deaths to 7,000-8,000, it is referring to the formal sector. In the informal sector the uncertainty is too great for Glen Mpufane to dare say a number. “But the death toll is definitely higher than in the formal sector,” he says. Adding value to coconut at Aelan Ltd. in Vanuatu. Credit: Commonwealth Secretariat. PORT VILA, Apr 18 2019 – In the Pacific, coconut is king. Known as the ‘tree of life’, locals make use of every part of the tree to survive – the fruit for eating, husks for fuelling fires, fronds for making multiuse baskets, and the trunk for building houses. Coconuts also drive economic growth, with Pacific Island countries supplying 50 per cent of the world’s copra trade. Papua New Guinea is the world’s largest exporter of copra – the dried coconut flesh from which oil is extracted – followed by Vanuatu. However, fluctuating global copra prices can leave small Pacific economies very vulnerable. 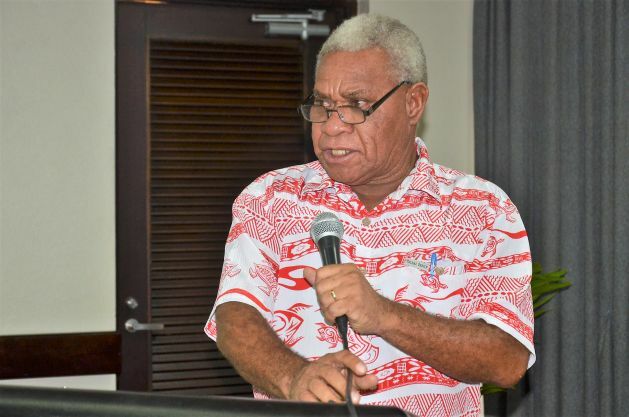 Opening a Commonwealth workshop on micro, small and medium enterprises in Port Vila last week, Vanuatu’s Deputy Prime Minister Bob Loughman explained: “In 2017, Vanuatu exported 1.8 billion worth of copra (roughly USD 18 million). In 2018, the global price plummeted, and as a result the value of our copra exports fell by 75 per cent. Vanuatu Deputy Prime Minister Bob Loughman wants the country to focus on value addition and moving up global value chains. Credit: Commonwealth Secretariat. Learning from experience, the island nation of 280,000 people set out to transform the way it trades with others. The aim is to move up the ‘global value chain’ – the production cycle from the field to the final product – to target higher value exports. These aspirations have been backed by EUR 20million from the European Development Fund for the Vanuatu Value Chain Programme. But as for many other small island states, there are several key hurdles to overcome. In Port Vila, Commonwealth acting head of trade competitiveness, Sujeevan Perera, told delegates about a cruise ship which once docked at a Caribbean destination and exhausted the country’s beer supply. It took a month before stocks were refilled. 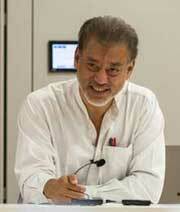 He said: “Pacific suppliers are mostly micro, small and medium sized enterprises (MSMEs). Would they be able to fill the demands of, say, a large supermarket that needs several 50ft containers of a product each week? There are possible solutions: one is having a regional hub, supplied by other smaller countries for export to a bigger client. Otherwise, businesses could focus on high value niche markets. The latter is a path local business owners are already actively pursuing. 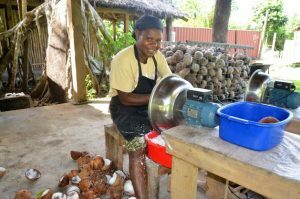 Sandrine Wallez, manager of Alternative Communities Trade in Vanuatu (ACTIV) Ltd, is looking to export highly specialised goods such as vegan chocolate, virgin coconut oil and coconut jam. She said: “Nowadays, people are looking for more organic products. Pacific products are already organic by default, so we should take advantage of this. “However, we’re all facing the same problem in the Pacific: we are small, which is very difficult in this world market of bulk commodity and big volume. She urged development partners to support Pacific businesses in finding the right customers, networking, and developing a Pacific-wide brand that competes with others across the globe. The meeting in Port Vila on 10-11 April was the first to drill down into the issues faced by micro, small and medium enterprises in agribusiness, since the Commonwealth adopted its flagship programme on trade and investment. Known as the Commonwealth Connectivity Agenda (CCA), it aims to unlock $2 trillion worth of intra-Commonwealth trade by 2030. Delegates agreed the coconut sector in the Pacific has great potential. However, it needs commitment and coordination from a range of players, including government and businesses. CCA lead Kirk Haywood said: “This first meeting of the supply side connectivity ‘cluster’, or working group, acted as a platform for members to share experiences, forge networks, and exchange solutions for common problems. The meeting agreed on an action plan that will outline opportunities and challenges for small and medium agribusinesses, explore financing options, and look at harnessing technology for business development. ROME, Apr 18 2019 – As China has moved from a poor isolated country to a major player in the world economic and political sphere, developing countries need to learn how to engage. In the first of this two part article I explored how best developing countries could benefit from the ongoing and planned flow of investments into their countries. In this second part I look at some of the critical elements of China’s development experience and discuss what lessons could be drawn for policies and programmes in other developing countries. Given my background and experience I shall look at this issue from the perspective of agriculture and rural development, although the key ideas most likely also apply to other sectors. Overall growth in China over the past 25 years has years has averaged 9% per year!! This is while many other developing countries have struggled to keep growth above population increases. The key to this fast economic growth is China’s amazingly high investment rate – over 40% in the past two and a half decades. In comparison, most other developing countries struggle to reach investment rates of 15%. Much of the investment and the associated growth occurred in manufacturing and associated services which is what make the country the workshop of the world. However, it is important to recall that one of the key factors underpinnings China’ performance was strong agricultural performance with growth of around 4-5%. – this rate of growth in the agriculture sector is now a benchmark rate for other developing countries who wish to achieve rapid economic development. This relatively high growth had two consequences. Firstly, it helped maintain low prices, particularly for food and agricultural raw materials, and secondly, it allowed a massive release of labour from agriculture. The proportion of total labour employed in agriculture in China dropped from around well over 50% in 1991 to around 16% in 2018, a transformation that only a few other countries in the world, such as Thailand and VietNam even come close to. The low prices of food and agricultural raw materials, along with the transfer of labour out of agriculture, provided the cheap manpower and inputs that laid the foundation for China’s competitive growth in manufacturing and services. China’s agriculture growth reflects higher yields and productivity improvements, rather than an increase in inputs. Productivity increases took place along the full value chain, from postharvest handing to processing, packaging and marketing. This was the result of investments in machinery, equipment, irrigation, storage and logistics, as well as a strong push on research and technology diffusion. There were also changes in the structure of production which reflect changes in demand patterns particularly of richer, more urbanised consumers. Output of traditional cereals such as wheat and rice fell, while that of fruits, vegetables, livestock products and fisheries increased rapidly. China also integrated well with the world trading system, importing crops which were cheaper on the world market such as soyabean, needed for the rapidly expanding livestock sector; and cotton, needed for the textile industry. Several factors stand out from China’s experience that are of importance to other developing countries. The most important of these are: high levels of public investments in key infrastructure, which eased and facilitated private investments; a strong push for technological change and innovation; and a dynamic approach to institutional reforms and critical policy issues such as liberalization of trade and markets. However, other developing countries may find that implementing these lessons will not be easy and will require substantial changes in their governments do business. 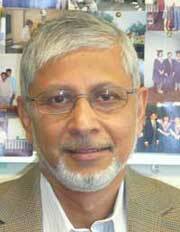 Developing countries need to raise investment rates, including in agriculture. However, low saving rates and poor taxation capacity limit the extent that this can be done. The funds needed to make transformative change will have to come from foreign sources and the only country that can do this at the scale required is China. The saving’s rate in China is around 50% of GDP and continues to outpace investment providing huge resources to invest overseas. Ensuring that developing countries attract, and then make the best use of Chinese investments is thus critical. This is a topic I dealt with in my preceding paper. At the same time, Governments in developing countries need to make far better use of the limited available public funds. In a number of countries, public funds from Government or donors are not spent in a timely manner due to bureaucratic and administrative inefficiencies. When they are spent, much goes into corruption; on appeasing political constituencies particularly by providing low-skill, unproductive jobs; or funding activities that are best left to the private sector. Developing countries also need to spend much more on research and technological innovation. Overall China spends over 2% of GDP on research and development – a massive US$200 billion/year. Spending on agriculture is lower – about 0.6% of Agriculture GDP – but this still makes it the largest public agricultural research system in the world. The only other developing countries which have anything similar in size and complexity are Brazil – which spends over 1.5% to 2% of agriculture GDP on research, – and India which spend around 0.3%. Actions to improve public spending, including larger allocations to research and technological innovations, require a mix of administrative and political actions which are the capacities of Governments of developing countries to implement if they so wish. However, getting the right mix of policies especially with regard to broad development visions and strategies is more complex. In the unipolar world which emerged after the fall of the USSR, neo-liberalism provided the dominant development paradigm. The success of China, and countries such as Viet Nam, are providing an alternative to this neoliberal paradigm where the role of the state is stronger, and markets are used to guide local decisions but with strategic directions and key economic levers in the hands of the Government. Most western academic institutions, traditional donor agencies and international UN agencies aligned themselves with the neoliberal view. However, developing countries faced with a successful and emergent China need to think harder about their development strategies and policies. This will require them to work closely not just with traditional donors and UN agencies but increasingly with academia, civil society and research institutions, at home as well as in China. As mentioned in the first of these two articles, this is something that developing country governments need to still need to learn how to do. Daud Khan has more than 30 years of experience on development issues with various national and international organizations. He has degrees in economics from the LSE and Oxford; and a degree in Environmental Management from the Imperial College of Science and Technology. UNITED NATIONS, Apr 18 2019 – For too long, women and girls have been excluded from the playing field—literally. But now, many are paving the way in the fight against gender inequality through sports. Sports is being increasingly used as a tool for empowering girls around the world, helping challenge gender norms on and off the field. Studies have found that promoting sports among girls can not only help improve their physical health, but also build self-esteem, courage, and leadership. Just last month, United Nations Women and the International Olympic Committee (IOC) joined forces to host the Women and Sports Awards which celebrated some of the change makers who have helped advance women and girls through sport. One such role model is Po Chun Liu who overcame numerous obstacles to become the first female baseball umpire in Taiwan and make the Forbes’ 2018 list of the most powerful women in international sports. “It’s our responsibility to empower girls and women so they’ll realise their full potential and take charge of their life…to help a girl is to help a family,” said Liu. “In today’s world, no organisation or country can afford to let half of the population be left behind – either in sport or in society. Advancing women in and through sport is truly a team effort. By joining hands and working together, sport can inspire the necessary change and lead the way,” he added. In the small village of Rangatungi in Bangladesh, Hanna Hemrom is leading the way to achieve this vision. Formed in 2014, the Rangatungi United Women Football Academy teaches football to girls, helping them feel empowered. After only seeing boys on the field, Hemrom sought the help of her teacher who persuaded some parents to let their daughters play football. “When the other girls and I walked from home to the football fields, people use to taunt us. They said we would not be able to get married because we wear shorts and play football. But we still carried on playing,” she recalled, adding that they struggled to persuade others to play. But with persistence and determination, girls continue to express interest and join the team, helping transform Hemrom and her fellow teammates’ lives. “I am a Santal girl who used to be very shy and didn’t mix with Bengali girls. Football has brought me close to other girls – Muslim, Hindu and we all play together now,” Hemrom said. “I think football is a good habit. Earlier girls in our village used to do nothing or just talk over phone or indulge in some silly things. We now play football with the girls and boys of our village,” she added. 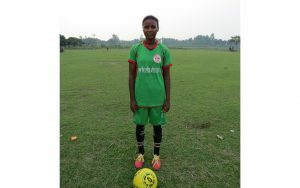 In 2016, the Rangatungi United Women Football team competed in the under 14 national football competition and a year later, they became the champions in the Rangpur division. Now the girls have even bigger dreams, aspiring to play for the national team and hoping to inspire others to dream big too. Young Bangla, the largest youth forum in Bangladesh, recognised the Rangatungi United Women Football Academy as one of the top 10 youth initiatives in the country.